The new joint centre will support innovative research into smart cities and fully integrated urban environments. We see it as an essential part of Cambridge’s contribution to society to tackle some of the great world problems. But we cannot do this on our own. We can only accomplish great things by working together – which is what we will be doing with Nanjing. 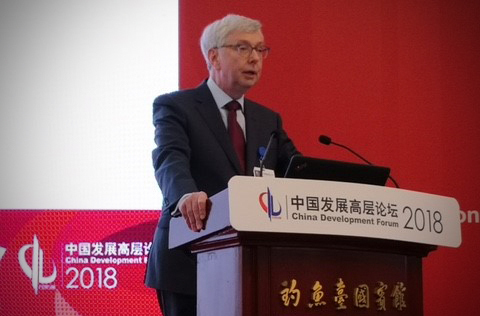 Professor Stephen Toope, the University of Cambridge’s Vice-Chancellor, today signed an agreement to formalise a strategic partnership with the Nanjing Municipal Government. The creation of the Cambridge University-Nanjing Centre of Technology and Innovation will entail the establishment of a joint research centre and the sharing of revenue derived from the commercialisation of intellectual property. It is the University’s first overseas enterprise at this scale. Funded by Nanjing Municipality for five years in the first instance, the project will have its own dedicated building in Nanjing’s Jiangbei New Area – a pilot urban development based on high levels of technological innovation. At the heart of the new Centre’s activities will be research into technologies that support a modern 21st century city with integrated IT, health care and building management. Innovations emerging from the Centre will enable the development of 'smart' cities in which sensors – applied at the individual level and all the way through to the level of large infrastructure – will enable sustainable lifestyles. As well as supporting health and wellbeing in new cities, the new Centre will help deliver efficient energy use through its academic and entrepreneurial activities. The agreement will fund positions in Nanjing, both academic and management, and will allow Cambridge-based academics to engage with specific, long-term projects in Nanjing. It will also support the establishment of a professorship, based in Cambridge, with responsibility as the Centre’s Academic Director. The project has been driven by Cambridge’s Department of Engineering, although it is hoped that there will be opportunities to widen participation to other departments and Schools. IP generated by research funded through the Centre will be licensed for commercialisation by the University’s innovation branch, Cambridge Enterprise. Mr. Luo Qun, a member of the Standing Committee of Nanjing's Municipal Party Committee, and Deputy Party Secretary of the Party Committee of Jiangbei New Area, added: "We sincerely hope that both sides will rely on this new Centre to push the world's technological frontiers and to promote the integration of science, technology, industry and financial innovation." The Vice-Chancellor was joined by Professor Sir Mark Welland, Head of the University's Electrical Engineering Division and Master of St Catharine's College. The signing of the agreement was witnessed by H.E. Dame Barbara Woodward, the United Kingdom's ambassador to China. The launch of the Cambridge University-Nanjing Centre of Technology and Innovation came only a few days after the Vice-Chancellor addressed the annual China Development Forum, in Beijing. Speaking on the subject of 'Knowledge Capital and development for all', Professor Toope said: "Of all the intangible assets that underpin our knowledge capital, the most precious is people. It is people who generate the new ideas; it is people who ask the searching questions, and collect the relevant data to answer them; it is people who make the discoveries; it is people who bring those discoveries to the market, and create the intellectual property. The conclusion I draw from this is that, for countries and institutions wishing to expand their knowledge capital, the single most important investment is in their human capital." He singled out equality and diversity as essential to the sustainability of knowledge-based capital, before concluding: “'Knowledge itself is power' is a famous line attributed to one of Cambridge’s most famous graduates – 17th century philosopher Francis Bacon. The question before us – particularly those of us in universities – is how we build and deploy and share all that knowledge for the greater good."